Service Costs > How Much Does Zeroez® Cost? How Much Does Zeroez® Cost? If you’re looking to get your carpets cleaned, you may have come across a company called Zeroez®. This company, as per their official website, claimed to help make your carpet feel clean and soft again, all without using dangerous chemicals. Using a green cleaning system, the company assures your carpets will be clean and safe by using its Zeroez® revolutionary cleaning technology. How much does Zerorez carpet cleaning cost? As all locations are independently owned, the costs will greatly depend on the location you choose, the current promotion being held and the size of your home/rooms which need to be cleaned. Doing our research online, we were able to find multiple people who shared the costs they paid, with the costs being $89 to $119 for three average sized rooms around 200 square feet. However, depending on the location, some did ask for a minimum spend. This Southern California location, for instance, states their minimum stands at $179. Each additional room, after the first three, will be about $50 each. To budget, we recommend budgeting $125 for the first three rooms since the company always seems to be running a promotion for around this price and another $50 per additional 200 square feet/room. with each additional 100 square feet in the same room running an additional $30. The company will charge “per room,” with the definition of a room being in the 200 to 250 square foot range, depending on the local franchise policy. Other areas, such as an area rug, stairs, bathrooms and hallways, will all be priced differently than the room rate. The Phoenix, Arizona location noted its price, claiming the first three carpeted rooms cost $129, with each additional 250 square foot room costing $43. Hallways cost $2 per linear foot, while stairs consisting of 16 steps and two landings will cost about $75. On this Yelp review for the Gilbert, Arizona location, one reviewer said he paid $180 for two rooms plus a deodorizer, while another paid $415 for 3.5 rooms, the tiled kitchen, bathroom and hallways. On this Las Vegas review, one reviewer stated they paid $160 for three rooms. While optional, the company can add a fabric protector to the carpets after the cleaning process. This added layer of protection will help the carpet’s ability to resist soiling and staining as the manufacturer’s layer wears down. Plan on spending an additional $25 per area. Pet treatment options, in the case of urine odors, can be another additional fee to consider. If a stain can’t be removed using the standard cleaning equipment, additional treatment options may be needed to see desirable results. Some franchises do offer air duct cleaning services for an additional fee. DIY products are available for those who are interested in doing the job on their own, including an environmentally friendly spotter, enzyme-based deodorizer and their Empowered Water™ technology for rinsing and spot cleaning carpets. Some franchises may charge a small furniture moving fee. First, the technician will pre-treat your carpets using a citrus based product to help break up any oil, dirt or other residues. Next, using its ZrLifter™️ service, this counter-rotating brush will help lift the piles of the carpet, effectively breaking up the dirts and oils. Lastly, Zerorez will use a method known as Empowered Water™ technology, which is an enhanced water that is electrolyzed and oxidized to create a powerful cleaning solution, all without the use of harsh chemicals. Being an effective cleaning agent, no soap or detergent will be required, which means no residues will be left behind. 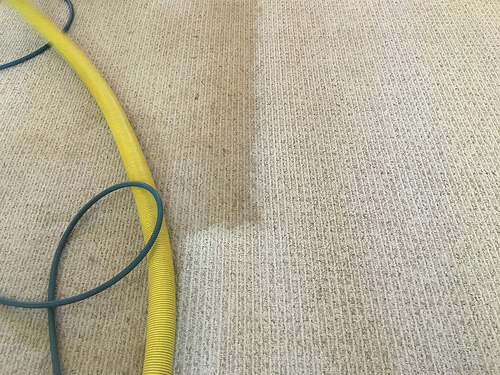 This patented process, according to the company, means your carpets will stay cleaner for longer and will dry even faster than the other traditional carpet cleaning services. The average dry time is between four to eight hours, but this time will be affected by the humidity and temperature inside the home. The company offers a Gotta Love It Guarantee™, which means, for any reason you’re not satisfied for the 30 days after the cleaning, they will return to your home and re-clean the areas you’re unhappy with. Aside from cleaning carpets, Zerorez can also clean upholstery, protect fabrics, clean/seal tile and countertops. However, as each franchise does vary, the services offered may vary from one to another. The company, depending on the location, seems to advertise on Groupon.com from time to time. Be sure to check out this daily deal website to see if there are any deals you can take advantage of. Pay attention to your local mailers as the company sends out exclusive coupons. You can also check out your local location’s official website to see if any offers are available at the time of purchase.